Coughing is not something we tend to associate with horses and ponies, but, actually, they are highly susceptible to respiratory problems. The causes of these can be allergic, infectious or anatomical, with some problems being easier to treat than others. Generally speaking, the causes of respiratory problems can be separated into four categories: bacterial/viral infections, parasitic infections, allergies, and anatomical defects. They can affect the nose, pharynx (throat), larynx (voice box), trachea (wind pipe) and lungs, which together make up the respiratory tract. Bacterial and viral infections can be easily contracted and spread, which is why early detection is essential. The two most serious examples are equine influenza (viral) and strangles (bacterial). Both are highly contagious and are easily spread between horses. Young horses and foals are most susceptible to these types of infection. Pneumonia, herpes virus, adenovirus and rhinovirus are other serious infections that need prompt treatment. Parasitic infections are another common cause of respiratory problems. Parasites that take nourishment from their host i.e. a blood meal, can transmit harmful infections through their secretions. In turn, they can affect the respiratory tract and cause chronic coughing. Lungworm is a harmful parasite that affects the lungs in this way as the parasite spends part, if not most, of its life cycle in the respiratory system. Unbeknownst to many of us, 70% of donkeys are infected with lungworm, although few will show symptoms. Because of this, horses that are grazed with donkeys are at high risk of contracting the parasite. Allergies to pollen and dust (found in hay, straw and stables) can also cause respiratory difficulties, prompting symptoms similar to those seen in human asthmatics. Allergy-related respiratory problems are scientifically referred to as chronic obstructive pulmonary disease (COPD). They are easily triggered by airborne irritants that cause narrowing of the airways and lead to coughing, wheezing and gradual loss of performance. To avoid allergies, bed your horse on shavings, shredded paper or rubber mats rather than straw. Keep stables clean, mucked-out and well ventilated. Feed dampened mixes and a hay alternative i.e. grass. Lastly, anatomical defects involving the structures of the respiratory tract i.e. the trachea, pharynx, larynx, soft palaye and epiglottis, can cause partial obstruction of the airways and lead to breathing difficulties. While any horse can experience anatomical problems, they are most common in large, competition breeds (warmbloods) and can usually be corrected through surgery. - Coughing when eating, exercising or during mucking-out. - Nasal discharge - ranging from mucous-like to clear, and white or yellow in colour. - Gland swelling in the throat. - Increased respiratory rate (normal = 8-20 breaths per minute). - Increased heart rate (normal + 30-50 beats per minute). - Noticeable abdominal effort when breathing ('heaves'). On noticing any of these symptoms, isolate the affected horse to avoid the spread of infection (equine influenza and strangles are highly contagious), and try to place it in an open and clean (dust-free) space, away from potential allergens. It is also worth taking your horse's temperature, pulse and respiration rate so you can relay this information to your vet when you contact him. 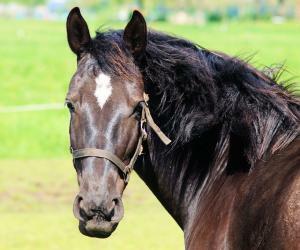 Avoid feeding and exercising your horse until you have spoken to your vet and been advised. However, do offer fresh water to keep your horse hydrated at all times. To view VioVet's complete range of respiratory supplements, click here.